For the past three decades, cinematic depictions of the past have taken us from images of bourgeois nostalgia to the frontiers of historical and cultural representation. The 1980s heritage cinema featuring elegant, reminiscent films like A Passage to India (David Lean, 1984) and Maurice (James Ivory, 1987) set off a critical debate on hidden histories revealing the intricate reality of political struggles based on gender, sexuality, class and ethnicity (Cartmell, Hunter and Whelehan; Higson; Monk and Sargeant; Vincendeau). With the advent of a more sexually explicit, violent and self-conscious post-heritage cinema (Monk, “Sexuality”) in the 1990s, with films such as Orlando (Sally Potter, 1992), The Piano (Jane Campion, 1993) and Elizabeth (Shekhar Kapur, 1998), the discussion on heritage cinema began to explore the postmodern interaction between history and contemporary themes and aesthetics (Cartmell, Hunter and Whelehan; Monk and Sargeant; Pidduck; Vincendeau). The grand style of heritage cinema, with its emphasis on authentic dialogue and period surroundings, produced a postmodern counterpart intentionally favouring the contemporary directness of, for example, modern dialogue, extreme close-ups and hand-held camera movements. Now, an interacting coexistence of heritage and post-heritage aesthetics transpose historical and literary texts into haptic textures of fabric, skin, shape, sound, colour and movement, making the past ever more tangible in the present and disclosing a nonlinear sensation of time. We are in the habit of structuring time according to the linear logic of representation, which presents the past as chronologically different from the present. In the need to develop nonlinear modes of analysis to frame history in terms of our flowing reality, as Manuel De Landa indicates (257-274), this analysis will deviate from linear structures created by representation. Thus, the films selected for this analysis are by no means intended to act as prime examples. Instead, the cinematic process of transforming history into haecceity itself acts as the core focus of this article. In order to understand the nonlinear logic of time we need to create an ever-changing network of nonlinear connections and “become in relation to what we are seeking to understand” (Colebrook 46), hereby putting Deleuze’s rhizomic method of encounters into practice. Deleuzian film theory offers a novel understanding of cinematic sensations, revealing micropolitical processes of, for instance, becoming, (de)territorialisation and affect (Bogue, Coleman, Flaxman, Pisters, Powell). Together with the invention of new notions such as the kinaesthetic effects of cinema (Del Río), cinesexuality (MacCormack), haptic visuality (Marks) and the neuro-image (Pisters), the Deleuzian framework continues to create fresh insights into the classic and current cinematic image. However, in spite of the cultural impact of (post-)heritage cinema (Monk, “Heritage”), the combination of heritage with Deleuzian notions and method is rarely explored. Pidduck’s analysis of the contemporary costume film presents the first thorough encounter, focusing on Deleuze’s “movement-image” to unravel the spatial realities of place and location that frame the gendered, colonial or queer body. However, the spatial sensation of the past that I will discuss in this analysis aims to reveal how certain (post-)heritage productions transpose chronological history into a nonlinear sensation of haecceity: “a mode of individuation very different from that of a person, subject, thing, or substance” (Deleuze and Guattari, “Thousand” 261). As such, this article charts the internal multiplicity of time as duration; using new cinematic material, I will examine blocs of cinematic sensation that run parallel to the semantic perception of cinema. Thus, discussing the effects of affect and its abstract counterpart, haecceity, this article aims to disclose and affirm the nonlinear effects of time as creative, pure memory (Bergson 139). Jean-Luc Godard argues that cinema is “made from the same raw material as History” (87). The relatively young medium acts as an archive of historical images producing immediate sensations of the past. Conscious of its technological developments, it not only records its own past but also captures images of quotidian reality that typify specific periods of time. Due to the recording quality of cinema wherein time, image and technique are irrevocably intertwined, film immediately captures the becoming-history of the present. In the films I will discuss below, however, cinema creates nonlinear movements between past and present. Eric Rohmer’s The Lady and the Duke (L’anglaise et le duc, 2001) is an adaptation of Grace Dalrymple Elliott’s Journal of My Life During the French Revolution (1859). Unlike the historical fantasy Dark Portals: The Chronicles of Vidocq (Vidocq, Pitof, 2001), where the entire space of eighteenth-century reality (from streets to rural landscape to interiors) has been transformed into the first fully digital spectacle of the past, The Lady and the Duke creates a more basic and reserved encounter between history and the rise of cinematographic digital technology. The film literally stages the past in the present, merging its cinematic space with the theatrical space of an eighteenth-century play. Actors are digitally inserted into tableaux, painted by the French artist and designer Jean-Baptiste Marot, to re-enact historical vistas of Paris that have disappeared for the present-day viewer. The artificial quality of the two-dimensional exterior scenes is continued in the staged effect of the isolated blocks of sound, in the estranged use of expository intertitles and through the studio-staged interior sequences bringing camera movement down to a reserved minimum. This contemporary effect of self-conscious, oscillating anachronism does not yet account for how The Lady and the Duke creates a genuine nonlinear sensation of time. 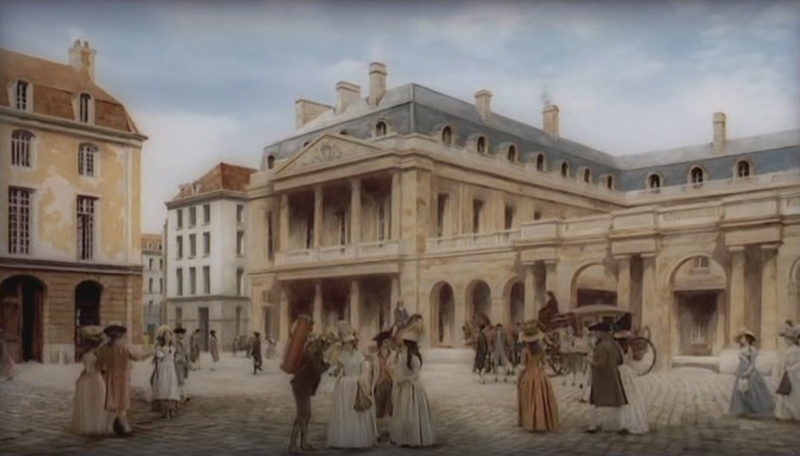 The film opens with a painted street view in Paris during the Reign of Terror (5 September 1793 – 28 July 1794). 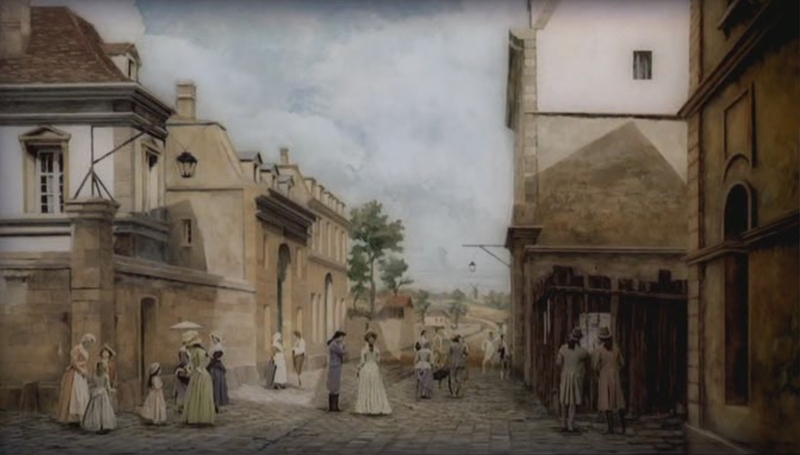 The audience is introduced by a voice-over narrator to the newly-paved rue de Miromesnil with its townhouses still bordering the countryside. Four years earlier, Grace Elliott, an intelligent and educated courtesan of Scottish birth, came to live in France as the mistress of Louis Philippe II, Duke of Orléans, a cousin of the King of France. Their friendship continued after their affair ended and Elliott remained in her Parisian townhouse at the rue de Miromesnil. This location, a minor fact in the grand course of history, acted as the premise for Rohmer’s film to turn Elliott’s memoirs into a cinematic “Taste of History”, a phrasing used by Rohmer in his interview with Ferenzi: “I am very interested in places”, Rohmer explains; “the fact that this place still exists [asserted by an historical article on Elliott read by Rohmer], we can locate it, struck me particularly” (Ferenzi). The lost authenticity of the locations—with their particular architecture, the eighteenth-century Parisian cityscape and its surrounding rural landscape—is not captured through the mimetic representation of a recorded past. Instead, it is the performative quality of the filmic image that transposes the recorded historical space of events into a cinematic site of memory. Here, The Lady and the Duke creates a shift from matter to memory (from representation to performance) that aligns with the Bergsonian notion of space as no longer exterior (matter), but “based in things. . . between things and between durations” (Deleuze, “Bergsonism” 49). The “between-time” (Deleuze, “Madness” 387) created by the cinematic image in The Lady and the Duke dislocates mimetic representation to perform the historical past according to the seemingly whimsical and nonlinear logic of memory. Thus, the theatrical space placed within a cinematographic frame ceases to be chronological when the performance-image transforms the material space (of location) into a spatial sensation of time (memory). The consciousness that manifests itself here through the sensation of memory, or pure past, is that of duration. A similar sensation has been described by Marcel Proust in his well-known passage on the shell-like madeleine cake. The flavour of almond in the madeleine when dipped in lime-blossom tea takes Proust suddenly back to his childhood experiences in Combray. This involuntary memory evokes an atmosphere both personal (a specific childhood memory) and impersonal (the pure sensation of time, also experienced in the co-existence of past and present when one has the feeling of a déjà vu). Performances of the past in Eric Rohmer’s The Lady and the Duke (L’Anglaise et le Duc, 2001), where actors are digitally inserted into painted tableaux of historical vistas of Paris during the French Revolution. Source screenshots: Pathé Image Production and Compagnie Eric Rohmer. The nonlinear effect of pure past created by the film’s performance of the past lies in the fact that, unlike mimetic representation, which aims for recognition, resemblance and a homogenising understanding of reality, resulting in a chronological presentation of time, performance displaces the actual present of the past, “by which the past is embodied only in terms of a present that is different from that which it has been” (Deleuze, “Bergsonism” 71). Here, history is not just a way of chronologically arranging facts and events of the past, of understanding the past through the linear tracing of cause and effect, but is grasped through a different logic, where a nonlinear sensation of time allows us to enter the rhizome of the past. In such rhizome, history can be grasped through the artistic quality of haecceity—the spatiotemporal experience of speeds, movements, textures and affects. The White Ribbon (Das weisse Band, Michael Haneke, 2009) is a stark film depicting the mysterious events of violence in a small Protestant village on the eve of the First World War. The profound effects of petit-bourgeois constrictions in postwar Germany that Fassbinder captured in films like Ali: Fear Eats the Soul (Angst essen Seele auf, 1974) finds a disturbing historical precedent in The White Ribbon, as the film continues Fassbinder’s investigation into social processes but looking at a previous era. The children in the village mirror the adults’ inconsequent following of religious ethics with which they mask their misuse of power and their buried outbursts of violence, hatred, disdain, humiliation and abuse. Haneke’s films are hard to watch; transporting his incisive observation of the malfunctioning of present-day society to the past does not produce a nostalgic picture. For nearly two and a half hours, the film entraps the audience in the claustrophobic social vacuum created by the inhabitants of this village. The absence of colour creates a sharp contrast with today’s typical cinematic experience. What is more, the black and white images both mirror and compound the harsh relationship between the adults and the children portrayed in the film. The intense chiaroscuro lighting frames the protagonists against their surroundings. The lack of colour is enhanced through the absence of musical commentary, which brings the film’s ambient noises to the fore. Creaking doors and cautious footsteps are reverberated by dark wooden panelling; muffled sounds in dank corridors become the sounds of doubt and fear that trickle through this society. Seconds slow down when the camera halts to stare at the small door opening at the other end of a room, a square light in an almost compact, black block of space. It waits for the little boy, Rudi, the doctor’s son, to return. He cannot sleep and goes to look for his sister who, when found with her father in his practice room, wants to spare him the truth of their father’s sexual abuse. The stifled sensation caused by the images clings to the characters, the children in particular. When the village’s pastor preaches to his son, Martin, about the evils of masturbation, the film technique of shot/reverse-shot maps the disparity between father and son. With his back to his son, feeding the bird, the father continues to speak of his worries. The pastor’s black jacket creates a tense contrast with Martin’s face lit by sunlight. The white ribbon tied around the son’s arm becomes almost translucent in this light. Meant to remind Martin of his sins, it acts even more as a reminder to the audience of the small acts of terrorism meticulously perpetrated by these people. The film images are stripped bare to a stifling soberness. They offer no distraction. The film viewer is caught in the oppressive reality of emotional exclusion that creeps into the sensory system. Martin, the pastor’s son, resisting the humiliating speech by his father. 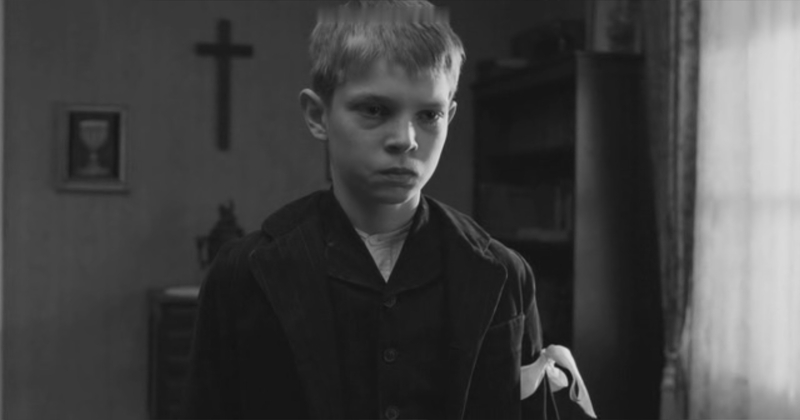 Contrasting qualities of the cinematic image turn sensation into duration in Michael Haneke’s The White Ribbon (Das weisse Band, 2009). Source screenshot: X-Filme Creative Pool, Wega Film, Les Films du Losange. The lived reality of sensations produced by cinema give the human eye the capacity of the senses that allows the film spectator to experience historical images as immediate sensations of memory. Strong mnemonic sensations are portrayed in the French film The King’s Daughters (Saint-Cyr, 2000) by Patricia Mazuy. The French title refers to the name of the boarding school established in 1684 by Madame de Maintenon, the mistress of Louis XIV, to turn orphans of noble birth into liberated women. During the opening credits, after a short historical introduction, the image appears of a long and rather muddy road. Branches form bare silhouettes against the bleak winter sky; six Dames of Saint-Cyr adorned with the fashionably tall lace headdresses (fontange) run at a steady pace in our direction. To prevent mud from ruining their clothes, they hold up the panels of their silk gowns as high as they can, somewhat improperly exposing the depths of their multilayered petticoats. The ridiculous scene continues with the appearance of a young man pulling a sturdy lady up the sloping road with a brouette, a covered sedan chair supported by two wheels. The following shot shows a parade of coaches and open carts approaching in the opposite direction. They transport the daughters of deceased or impoverished aristocratic parents to Madame de Maintenon’s boarding school. The shaky camera faithfully renders the bumps and potholes of the road. Surely, the court life of the mistress of Louis XIV and her students provides no wistful picture for the modern spectator to admire. Dirt finds itself in long uncombed hair, on faces, and on the dresses which, battered by wind and rain, lose their elegant shape. In fact, the women are constantly struggling with the uncomfortable pieces of cloth that make up their fashionable costumes. The sensations produced in The King’s Daughters move back and forth between matter and memory. To evoke a collective memory of pure past, the film materialises singular images of fabric, landscape, the clumsy movement of a body, the incessant rhythm of the wind, or the song of swallows. If cinematic images are “made from the same raw material as History”, as Godard states (87), explaining the cinematic process of instantly archiving the present, the film images discussed above produce a line of flight out of this History as their becoming-present of the past transforms the material of history into duration. As Rohmer indicates: “we are in the moment, in the present, and that is why it is cinematographic” (Ferenzi). This double movement of actualisation, be it of the past or of the present, aligns itself with the Bergsonian paradox pointing to the spatial effects of time. On the one hand, this means that the pure past is a rhizome that has no need of chronology to exist as memory, which produces connections not by way of cause and effect, but through associations of, for example, movement, speed, rhythms, colour. On the other hand, this leads to the conscious perception of affect as our subjectivity in time—or, to be more precise, “[s]ubjectivity is never ours, it is time” (Deleuze, “Cinema 2” 82-83). Even though sensory images let us experience a certain “thisness” of the past, the evoked sensation or affect must not be confused with haecceity. The sensory becoming of a subject that embodies an affect is different from the conceptual becoming that gives life to a haecceity. Both answer to the process of becoming, of becoming-other, “a change that is substance itself” (Deleuze, “Bergsonism” 37). But, for affect, this becoming manifests itself in a matter of expression, while a haecceity is a becoming-intense, “heterogeneity grasped in an absolute form” (Deleuze and Guattari, “Philosophy” 177). In a similar fashion, affect must not be confused with feeling. Deleuze followed Spinoza’s explanation of affect in 1677, by pointing to the distinction between emotion (affectio) and affect (affectus) (“Spinoza”). Emotions such as love, pain, fear and compassion are feelings realised by meaning. Sensation or affect precedes meaning. As Elizabeth Grosz explains in Chaos, Territory, Art, “[s]ensation impacts the body, not through the brain, not through representations, signs, images, or fantasies, but directly, on the body’s own internal forces, on cells, organs, the nervous system” (73). Affect is a pure sensation prior to interpretation and meaning, it is immanent in the arts. Affect functions as an ‘inter’, a space of movement, creating a sensation of continuous becoming that turns the body into “a set of variously informed ‘speeds’ and ‘intensities’” (Kennedy 98). The sub-representative domain of sensations offers access to unconscious and multiple processes that form our perception. According to Brian Massumi, information and affect are closely linked. Commercial images make a deft use of affect to shape our experiences, taste and desire. In Parables for the Virtual (2002), Massumi even analyses how influential decisions on the global market are less determined by facts than by the sensory responses to those facts. In the case of a historical film, the sensory quality of images can produce such intense sensations that the past is returned to the present, not as a representation but as a newly lived experience of presence. In this sense, Deleuze’s concept of affect shows an interface with Hans Ulrich Gumbrecht’s notion of ‟presence” that precedes the semiotic models of interpretation in pushing “the distance between us (the subject) and the world (the object) up to a point where the distance may suddenly turn into an unmediated state of being-in-the-world” (Gumbrecht, 137). When an artistic presentation of historical events is perceived through its affects, different perceptions of rhythm and movement will be possible. Following this line of reasoning, Simon O’Sullivan indicates that artistic production will not turn to representation to please an existing audience. Instead, art creates new sensations for a people yet-to-come: “The practice will involve the production of novel constellations of affects, away from opinion, away from habit, away from the clichés of so-called culture (the affective assemblages offered to us on a daily basis)” (156). In the next section, through the final film of this analysis, I will discuss more in depth how sensory images of affect transform history into a haecceity. In Coco Before Chanel (Coco avant Chanel, Anne Fontaine 2009), past and present are juxtaposed through the faces of two famous French women of different eras: Audrey Tautou and Gabrielle “Coco” Chanel. While the latter appears in almost all of her photos with an incisive look, the first became the epitome of “cuteness” after her international breakthrough with Amélie (Le fabuleux destin d’Amélie Poulain, Jean-Pierre Jeunet, 2001). 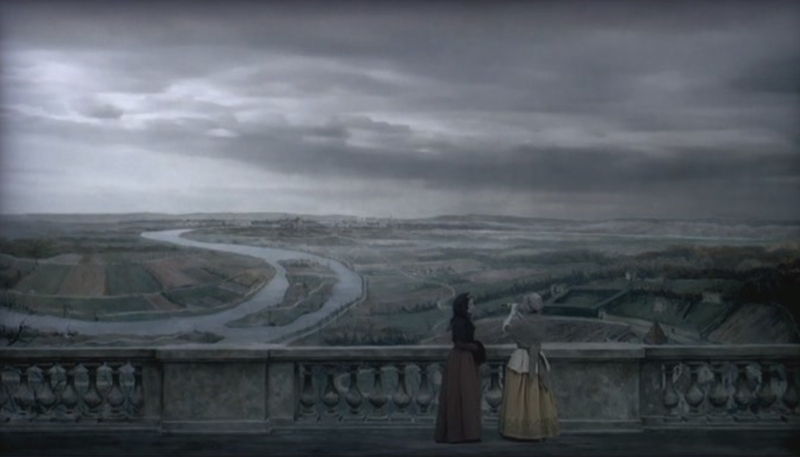 To explain the singular effect of affect grasped by Fontaine's film in this striking encounter between the two women and the diverse style and expression that mark their centuries, I will focus on a typical Deleuzian feature of affect—the face—to investigate in more detail a cinematic look on the rhizomes of the past. The face becomes interesting when it ceases to be a face, Deleuze and Guattari point out in their chapter “Year Zero: Faciality” (“Thousand” 190). This inimitable logic offers the perfect starting point from which to grasp the difference and the relationship between emotion, affect and history becoming haecceity in Coco Before Chanel. At first glance, the face leads to the notion of expression. Emotions are expressed through the face; a raised eyebrow or a spontaneous smile can easily put a feeling or opinion across without the use of words. However, Deleuze and Guattari push the expression of the face beyond a communication of emotions. They do not refer to the individual expression of a face, but to the way we read faces. This is a process of the scanning and mapping of a surface; of proportions, speeds, intensities and textures. This form of perception produces sensations that go beyond the chronological sense of time that habitually separates the past from the present. The “face” of Chanel is her hands. In a skilful move, Coco’s hand slides the marking chalk, held between her thumb and forefinger, over a black piece of fabric. Straight lines are drawn at right angles; a flat parabola becomes the neckline. Moments later, a pair of scissors cut along the white lines that form the panels for a dress. The extreme close-ups of Coco’s hands, marking chalk and scissors, fill the silver screen. Isolated sounds of soft chalk on fabric and the snip of cutting scissors drown out the film music. This sensation of matter brings the past to the sensory present of the viewer. The scene constructs a collective memory, or, as Deleuze writes, “it makes the past context inseparable from the present sensation” (“Proust” 60). Similar to a personal recollection, facts can come alive through fiction. The sensation this scene in Coco Before Chanel triggers in the spectator works as a cinematic version of Proust’s involuntary memory. The film as collective memory creates an experience of history that has nothing to do with the actual past once present, or with today’s present. Coco Chanel “rises up as past. . . in a pure past” (“Proust” 60-61). Through sensations of materiality, the film leads its audience to a singular sensation of history, “an hour, a season. . . a life” (“Thousand” 262). Thus, the cinematographic memory of Chanel’s early life produces a dislocation in history through which we can access her past. The film aims not so much for a realistic view of Coco’s life, but tries to uncover the unwritten history of singular sensations, to reveal the essence of her radical way of thinking and doing. Coco’s core philosophy manifests itself during a fitting session. Coco’s friend, the actress Emilienne d’Alençon, looks at herself in the mirror while a plain white collar is pinned down to her new dress for a masked ball. She finds the design too strict. Coco replies that Emilienne wanted to appear as an orphan. Emilienne, expecting romantic rags, demands that Coco tears the fabric to show off her breasts and thighs. Coco replies that it is much more exciting to leave such things to the imagination. The philosophy behind the sophisticated style that marks the House of Chanel together with its emphasis on a comfortable fit becomes even clearer when Coco and her new boyfriend, Boy Capel, visit the beach. Both are surprised by the many costumes with tight corsets, impractical ribbons, bows and veils. Constricted and all-dolled-up women in 1910 still carry the heavy fashion of La Belle Époque. The same day, Coco orders an evening dress in a boutique demanding that the corset and ruffles be exchanged for a loose and simple elegance. Whether Coco Before Chanel portrays an actual event here is a question that even her best biographers cannot answer. Chanel spun her own past between fact and fiction, and gave friends and interviewers different variations on a memory. Thus, the film acts in the spirit of this recalcitrant Mademoiselle when inventing a possible history. “The face of Chanel is her hands”: extreme close-ups from Anne Fontaine’s Coco Before Chanel (Coco avant Chanel, 2009) that bring textures and movements of Chanel’s past to the sensory present of the viewer. Source screenshots: Haut et Court, Ciné@, Warner Bros. Entertainment France, and France 2 Cinéma. Chanel, as a fashion pioneer and as an independent businesswoman, is an icon. Her “face” is a mask that she carefully built in the years. The merciless capacity of film to register the smallest details enables director Anne Fontaine to portray the transitory movements and rhythms that mark Chanel’s personality. Here, the “face” of Chanel is composed of her hands and fingers working accurately and diligently, discreet hands that repair torn lace with thimble, needle and thread, or that pin the hem of a dress to the ground, the hands that roll up a cotton pouch for sewing things. The camera captures bored fingers waiting for new work, industrious fingers and fingers that clamp a smouldering cigarette. Coco’s hands frequently appear in extreme close-up. Here, the film creates a “face” of Chanel which ceases to be a face: “the face is in itself the close-up, the close-up is by itself face and both are affect“ (Deleuze, “Madness” 387; “Cinema 1” 88). Repeating this image of the face/close-up throughout the film, Coco Before Chanel turns this singular affect into a cinematic duration that transforms history into a haecceity. Next to her image as a hard and precise worker: Chanel is also known for her androgyny. Dressed in men’s clothing, she looks like a boy; she rides a horse in a man’s saddle; she prefers to appear with bare arms at a ball, ignoring the convention of wearing gloves to formal events, and she smokes, which was still quite indecent for a woman in those days. Her flowing dresses have low waists and unaccented bosom. Coco’s first visit to the sea inspires her to make the famous striped sailor shirt. It is through Audrey Tautou’s androgynous appearance that past and present come together. In an interview with director Anne Fontaine for Vogue she underlines the importance of this encounter between time and body: “[Audrey Tautou] is so thin, like a little boy when you see her from the back, and Chanel also has a very different body for this period. That is very important because if you have another body you create another way to wear this body” (Milligan). In presenting the face of Chanel through images of matter and androgyny, Fontaine’s film creates an ahistorical sense of time that underscores the immortality of Chanel. Both affect and haecceity act as membranes between cinema and history. “All works of art share something in common”, Elizabeth Grosz explains, “whatever else may distinguish different forms, genres, and techniques from each other: they are all composed of blocks of materiality becoming-sensation” (71). Singular sensations of affect effected by the material quality of the film image enable the film viewer to experience a becoming-other. The affects discussed in this article open up a nonlinear consciousness of time, of duration: a timespace. They induce a movement in consciousness from a historical perception of the past, grounded in a chronological idea of time, to time as a haecceity, which entails an alternative, cinematic mapping of history in terms of textures, blocks of sound, movement and speed that enter into composition with each other. Both affect and haecceity belong to the domain of cartography, allowing us to map the visual rhythms of painted tableaux, the touch of music, the texture of cinema, producing both a becoming-history of the present and a becoming-present of the past. This article discussed the transformation of history into haecceities that allow us to grasp history through a nonlinear, cinematic sensation of pure past. In other words, haecceities produce a counter-history of Deleuzian “between-times” produced through a spatial or ahistorical connection between the past and our present. This is where cinema merges our classical knowledge of historical moments with the lived reality of the unrecorded past. Experiments with spatial reframings of the past in The Lady and the Duke, The White Ribbon, The King’s Daughters and Coco Before Chanel have been discussed to present, create and affirm nonlinear sensations of duration that in the first place link with Deleuze and Guattari’s notion of affect. Such notion transforms history into cinematic sets of speed, movement and texture. Correspondingly, I have argued that the linear narrative of history is transposed into the abstract sensation of time as haecceity, a pure past, where time and space come together to put the sensory quality of memory to the fore. Shifting the perspective from the linear account of history to the multilinear affects of haecceity, this article challenges the cultural hegemony of representation that favours a homogeneous image of thought where time is a matter of chronology. Accordingly, I focussed on the spatiotemporal relations captured in the material qualities of the cinematic image, which allowed me to create an analytical perception through the transitory experience of the senses. 1. The four aspects of representation discerned by Deleuze as “identity”, “analogy”, “opposition” and “resemblance” (“Difference” 29) produce a methodology following a logic of homogeneity, hierarchy, stasis and causality. Accordingly, and without considering the notion that “human history did not follow a straight line, as if everything pointed towards civilized societies as humanity’s ultimate goal” (De Landa 16), historical processes are traditionally chronologically structured according to the linear logic of representation. 2. Marot, Jean-Baptiste. “Tableaux for the Cinema”, Neil Young’s Film Lounge. 23 March 2004. Web. 9 Sep. 2011. 3. Here and elsewhere, my translation (EW). The Lady and the Duke [L’anglaise et le duc]. Dir. Eric Rohmer. Pathé Image Production, and Compagnie Eric Rohmer (CER), 2001. DVD. Ali: Fear Eats the Soul [Angst essen Seele auf]. Dir. Rainer Werner Fassbinder. Filmverlag der Autoren, Tango Film, 1974. DVD. Bergson, Henri. Matter and Memory. 1991. Trans. N.M. Paul and W.S. Palmer. New York: Zone Books, 2002. Print. Bogue, Ronald. Deleuze on Cinema. New York and London: Routledge, 2003. Print. Cartmell, Deborah, I.Q. Hunter, and Imelda Whelehan. eds. Retrovisions. Reinventing the Past in Film and Fiction. London and Sterling: Pluto Press, 2001. Print. Coco Before Chanel [Coco avant Chanel]. Dir. Anne Fontaine. Haut et Court, Ciné@, Warner Bros. Entertainment France, and France 2 Cinéma, 2009. DVD. Colebrook, Claire. Gilles Deleuze. London and New York: Routledge, 2002. Print. Colman, Felicity. “Deleuze’s Kiss: The Sensory Pause of Screen Affect”. Pli: The Warwick Journal of Philosophy. 16 (2005): 101-113. Print. De Custine, Astolphe. Letters from Russia. The 1843 Translation. New York: The New York Review of Books, 2002. Print. De Landa, Manuel. A Thousand Years of Nonlinear History. New York: Swerve Editions, 2000. Print. Del Río, Elena. Deleuze and the Cinemas of Performance. Powers of Affection. Edinburgh: Edinburgh University Press, 2008. Print. Deleuze, Gilles. Bergsonism. 1991. Trans. Hugh Tomlinson and Barbara Habberjam. New York: Zone Books, 2002. Print. ---. Difference and Repetition. 1968. Trans. Paul Patton. London and New York: Continuum, 2001. Print. ---. Cinema 1: The Movement-Image. 1986. Trans. Hugh Tomlinson and Barbara Habberjam. London: Athlone Press, 2002. Print. ---. Cinema 2: The Time-Image. 1989. Trans. Hugh Tomlinson and Robert Galeta. London: Athlone Press, 2000. Print. ---. Proust and Signs. The Complete Text. Trans. Richard Howard. Minneapolis: University of Minnesota Press, 2000. Print. ---. “Spinoza. Cours Vincennes - 24/01/1978”. Trans. Timothy S. Murphy. Webdeleuze. Web. 16 Jan. 2012. ---. Two Regimes of Madness. Texts and Interviews 1975-1995. Trans. Ames Hodges and Mike Taormina. New York and Los Angeles: Semiotext(e), 2006. Print. Deleuze, Gilles, and Félix Guattari. 1988. A Thousand Plateaus. Capitalism and Schizophrenia. Trans. Brian Massumi. London and New York: Continuum, 2003. Print. ---. What is Philosophy? Trans. Hugh Tomlinson and Graham Burchell. New York: Columbia University Press, 1994. Print. Elizabeth. Dir. Shekhar Kapur. Polygram Filmed Entertainment, Working Title Films, Channel Four Films, 1998. DVD. Amélie [Le fabuleux destin d’Amélie Poulain]. Dir. Jean-Pierre Jeunet. Claudie Ossard Productions and Union Générale Cinématographique (UGC), 2001. DVD. Flaxman, Gregory. ed. The Brain Is the Screen. Deleuze and the Philosophy of Cinema. Minneapolis and London: University of Minnesota Press, 2000. Print. Godard, Jean-Luc, and Youssef Ishaghpour. Cinema: the Archeology of Film and the Memory of a Century. Trans. John Howe. Oxford and New York: Berg, 2005. Print. Grosz, Elizabeth. Chaos, Territory, Art. Deleuze and the Framing of the Earth. New York: Columbia University Press, 2008. Print. Gumbrecht, Hans Ulrich. Production of Presence: What Meaning Cannot Convey. Stanford: Stanford University Press, 2004. Print. Hallward, Peter. Out of This World. Deleuze and the Philosophy of Creation. London and New York: Verso, 2006. Print. Higson, Andrew. English Heritage, English Cinema. Costume Drama Since 1980. Oxford: Oxford University Press, 2003. Print. Kennedy, Barbara M. Deleuze and Cinema. The Aesthetics of Sensation. 2000. Edinburgh: Edinburgh University Press, 2004. Print. MacCormack, Patricia. Cinesexuality. Hampshire and Burlington: Asghate, 2008. Print. Marks, Laura. The Skin of the Film. Intercultural Cinema, Embodiment and the Senses. Durham and London: Duke University Press, 2000. Print. Massumi, Brian. Parables for the Virtual. Movement, Affect, Sensation. Durham and London: Duke University Press, 2002. Print. Maurice. Dir. James Ivory. Merchant Ivory Productions, Cinecom Pictures, Film Four International, 1987. DVD. Milligan, Lauren. “Tautou Perfect”. British Vogue. 4 Aug. 2009. Web. 9 Sep. 2011. Monk, Claire. Heritage Film Audiences. Period Films and Contemporary Audiences in the UK. 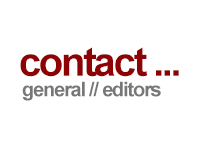 Edinburgh: Edinburgh University Press, 2011. Print. ---. “Sexuality and the heritage.” Sight & Sound. 5:10 (1995): 32-34. Print. Monk, Claire and Amy Sargeant. eds. British Historical Cinema. The History, Heritage and Costume Film. London and New York: Routledge, 2002. Print. Orlando. Dir. Sally Potter. Adventure Pictures, Lenfilm Studio, Mikado Film, 1992. DVD. O’Sullivan, Simon. Art Encounters Deleuze and Guattari. Thought Beyond Representation. Hampshire and New York: Palgrave Macmillan, 2006. Print. A Passage to India. Dir. David Lean. EMI Films, Home Box Office (HBO), Thorn EMI Screen Entertainment, 1984. DVD. The Piano. Dir. Jane Campion. Australian Film Commission, The, CiBy 2000, Jan Chapman Productions, 1993. DVD. Pidduck, Julianne. Contemporary Costume Film. Space, Place and the Past. London: BFI Publishing, 2004. Print. Pisters, Patricia. The Matrix of Visual Culture. Working With Deleuze in Film Theory. Stanford: Stanford University Press, 2003. Print. Powell, Anna. Deleuze, Altered States and Film. Edinburgh: Edinburgh University Press, 2007. Print. Russian Ark [Russkiy kovcheg]. Dir. Aleksandr Sokurov. The State Hermitage Museum and The Hermitage Bridge Studio, 2002. DVD. The King’s Daughters [Saint-Cyr]. Dir. Patricia Mazuy. Archipel 35, and Atelier Cinéma de Normandie (ACCAAN), 2000. DVD. Dark Portals: The Chronicles of Vidocq [Vidocq]. Dir. Pitof. RF2K Productions, 2001. DVD. Vincendeau, Ginette. ed. Film/Literature/Heritage. A Sight and Sound Reader. London: BFI Publishing, 2001. Print. The White Ribbon [Das weisse Band—Eine deutsche Kindergeschichte]. Dir. Michael Haneke. X-Filme Creative Pool, Wega Film, Les Films du Losange, 2009. DVD. Wortel, Elise. “From History to Haecceity: Spatial Reframings of the Past in Post-heritage Cinema”. Alphaville: Journal of Film and Screen Media 2 (Winter 2011). Web. ISSN: 2009-4078. Elise Wortel is an independent scholar. She received her PhD in Cultural Studies at Radboud University Nijmegen in 2008. Her dissertation Textures of Time: A Study of Cinematic Sensations of Anachronism examines a nonlinear method of encounters between cinema and theory to investigate and affirm the spatial effects of anachronism on our linear presentation of time. She has given lectures on film theory and film history, visual culture, performance, foodculture, cultural memory, nomadic strategies of invention, and Deleuzian cultural theory. 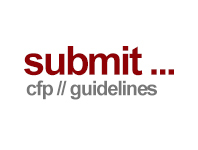 Current research areas include the nonlinear sensations of time and materiality in art and society.